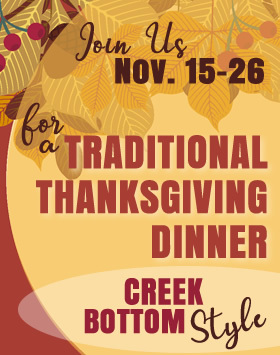 From Nov. 15 – 26, at the Country Club location in Galax, we will be serving a special Thanksgiving feast featuring smoked turkey breast, stuffing & gravy… Creek Bottom Style! Come out, give thanks and enjoy the holiday with us. We will be closed Thanksgiving Day, Thursday, Nov. 23.